Matt, Ben, Nicky and Kris live in the small country town of Coolongewong in the central west of New South Wales. Last year they discovered that on the day of the new moon each month their classroom became magic. By tripping on a creaky floorboard, crashing into the teacher’s desk and saying the magic words History’s a Mystery, they found that they could be transported back in time and experience exciting and sometimes dangerous adventures. Now they are about to start Year 6 with the school’s most popular teacher, Mr Mac, and enjoy another year in the magic classroom. Together they continue to go back into the past, to meet some of history’s most famous people and be present at some of history’s most crucial times. 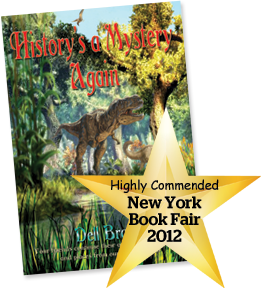 Their adventures take them from the age of the dinosaurs and the ice age to a visit into the future, from the Vikings and Aztecs to Ned Kelly and Jesus, from the Titanic to Gallipoli, with many other places and people in between. But suddenly, Ben’s face changed to deadly serious. Kris and Nicky looked at him and were puzzled. "What’s up, Ben?" said Kris. "You look like…"
"Shh," whispered Ben. "Don’t look now but there’s a dinosaur right behind you and it’s enormous!" The girls froze, as did Matt and Ben. They all looked up at this gigantic dinosaur towering over them. It seemed to be very curious about what had been making all those sounds in the long grass. And it had obviously never seen animals like the children before. The four friends remained very still. It was so scary but they had little choice. The dinosaur continued to stare at them for a few minutes. It must have then decided that the children were not a threat, for it started to come closer and soon its huge head was right down beside them, with its eye regarding them closely.